Very excited to announce my NEW guided tour… Women In Music – Divas, Rebels & Junkies 1722 - 2019. So what’s not to love about a songwriter’s muse? Think Pattie Boyd for both George Harrison’s Something and Eric Clapton’s Layla. And who amongst us can tear their eyes away from the spectacle of the pill-stoked diva throwing tantrums through a series of calamitous relationships with men who can be described at best as being Not Proper Boyfriend Material. Judy. Amy. Whitney. But – to borrow from the great Peggy Lee – Is That All There Is? Where are the rebels? The mavericks? The writers? The virtuosi? 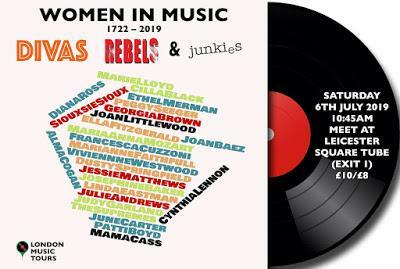 They’re on Divas, Rebels & Junkies – Women In Music 1722 - 2019, the walking tour, Saturday 6th July 2019 at 10:45am meet at Leicester Square tube exit 1. The track listing for this two-hour Musical Walking Tour in Three Acts features… the warring sopranos Francesca Cozzoni and Faustina Bordoni who drove Handel to distraction as they conquered London… the theatrical visionary and outsider Joan Littlewood who revolutionised British musical theatre… the folk purist Peggy Seeger who laughed Lonnie Donegan offstage… little Lillie Klot, the East End rag trade girl who, as Georgia Brown became this country’s finest interpreter of Kurt Weill and the original Nancy in Oliver!… the Harlem girl who was told she was too ugly to be a star and whose life was plagued with self-doubt - Ella Fitzgerald… Marianne Faithfull the convent girl of supposed aristocratic blood who topped the charts then hit rock bottom on the streets of Soho strung out on heroin, only to come back as one of the few true mavericks the British music scene ever produced… alongside Siouxsie Sioux, Marie Lloyd, Dusty Springfield, Jessie Matthews and more. The tour will end at The Palladium Theatre – we go out at the top – with Judy Garland topping the bill.